The Instant Pot (commonly known as the programmable pressure cooker) is our new favorite kitchen appliance. It isn’t required for freezer cooking, but it certainly does help, because you can cook your meals directly from the freezer. No thawing! To get you started, we have adapted the instructions for 50 of our best comfort food recipes to make them instant pot freezer meals. We also have resources, tips, and an Instant Pot Menus to introduce you to freezer cooking with an Instant Pot. 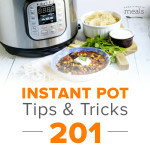 Instant Pot Tips and Tricks: Our best tips for Instant Pot recipes! 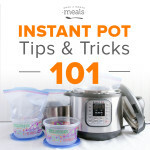 Troubleshooting Instant Pot Recipes: Hints on adjusting, adapting, converting and more! 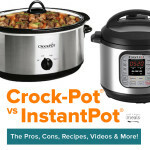 Crock-Pot VS Instant Pot: Pros, Cons, Recipes, Videos & more! 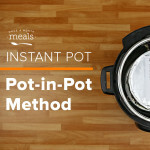 Pot-in-Pot Method: Learn what and how this method works! 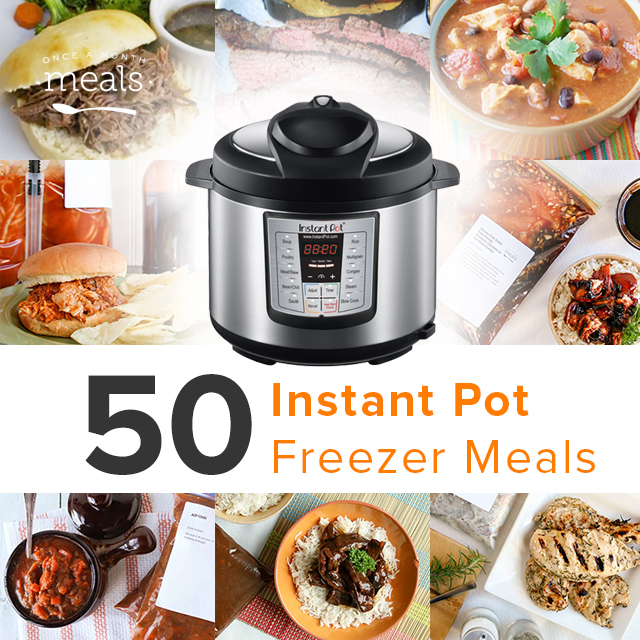 101 Instant Pot Freezer Meals: 101 MORE meals to cook from frozen! Members must be logged in to add the freezer version of these recipes to their custom freezer meal plan. Learn more about membership here. The first two links are the same – they both go to the gluten/dairy free version. 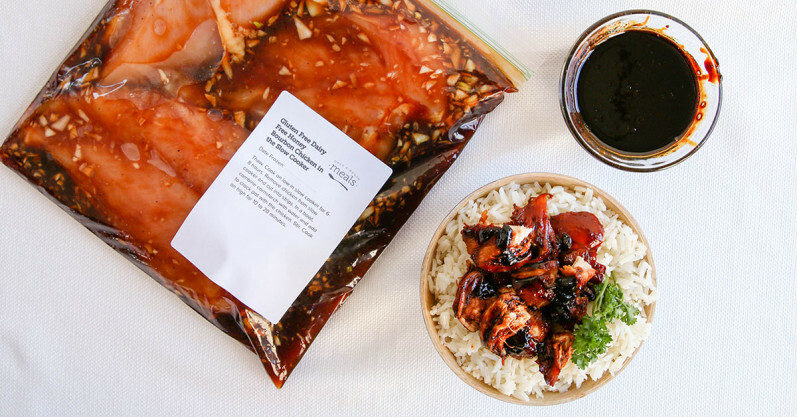 Please fix the link for the traditional version of the honey bourbon chicken. We often sing the praises of freezer cooking and how it saves our busy weeknights. We think you should be fine as long as you have a programmable Instant Pot and can set the timer and then have it set to “warm” until you get home. It would probably be best to try it on a weekend first, just so you can see how the meal turns out cooking and warming for the time that you will essentially be gone. Let us know how it turns out for you! Sure it would work! I love the delay timer feature. This is probably a silly question, but I just started looking at all of the recipes and noticed that some ingredients are in orange and some are in black. Is there a significance to the colors add to when things are added such as at freezing or cooking. Thanks! I think you should add an Instant Pot Jambalaya recipe to your list. We love jambalaya at my house & I’ve prepared it as a freezer meal many times. Gumbo too. Thank you for letting us know! We will be sure to pass this along to our MenuBuilder team! Can you use these recipes with a stovetop pressure cooker? You could but these recipes are specifically for an electric, programmable pressure cooker so cooking times may vary. Yes, you can cook beans for 2 in your IP! I got an instant or for Christmas. I love your recipes. Thanks, we hope you’re having fun and enjoying it! This list is awesome! However, I wish there was a menu list for each type of meat. When prepping freezer meals I like to buy a lot of whatever meat is on sale and prep meals with just that meat. It’d be great to have a chicken, pork, beef, and vegetarian meal list with grocery planning. With membership that is possible. If you have questions about membership, we’d be happy to chat with you in the bottom-right hand corner of the site. The ham and pineapple fried rice recipe isn’t showing up for me when I click on it. Darn this link is still not working. I apologize, it turns out this recipe was removed for further testing based on feedback we received from our test cooks. Thanks for your patience! 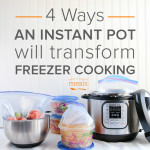 if your recipes are based on 4 servings, if I divided them in half for 2 servings per freezer packing, how would that affect the Instant Pot cooking time? As a member, you would have the ability customize serving sizes. If you have questions about membership, we’d love to chat with you in the bottom-right hand corner! We include a disclaimer on all of our IP recipes that states what the original serving size was when we made it fresh and that if cooking different amounts the time might need to be adjusted. 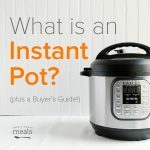 We encourage you to consult the Instant Pot Time Tables for reference: http://instantpot.com/cooking-time/ Enjoy! I don’t eat pork or shellfish. Which menu might be the best for me? You might like to start with our vegetarian menu, Meredith! We do also have vegetarian Instant Pot recipes. Enjoy! Do you have any instant pot weight watcher friendly freezer meals? We include nutrition information for all our Diet and Paleo recipes so that would be a great place to start! If you have more questions, we’re always happy to chat in the bottom right-hand corner! Happy cooking! This recipe has been removed for further testing based on feedback we received from our test cooks. We appreciate your patience! This is great. I’m still learning all the ways to use the Instant Pot. Today I made Brussel Sprouts with bacon and garlic. I’ve made this before on the stove top using pots and pans, but this was so much simpler and faster. Keep the recipes coming. I really enjoy them – and so does my family. Wonderful, wonderful!! Thank you for sharing, Steve! Hello! We have just bought our first pressure cooker and I have really only made sweet sausage, peppers and onions for sandwiches last week. I couldn’t believe how easy it was to make. The part that took the longest to do, was cutting the onions and peppers! Oh wait! I forgot that I have also made mac and cheese! Both have been easy, quicker and delicious! All this to say that I am really excited to learn more and get some delicious meals to make! 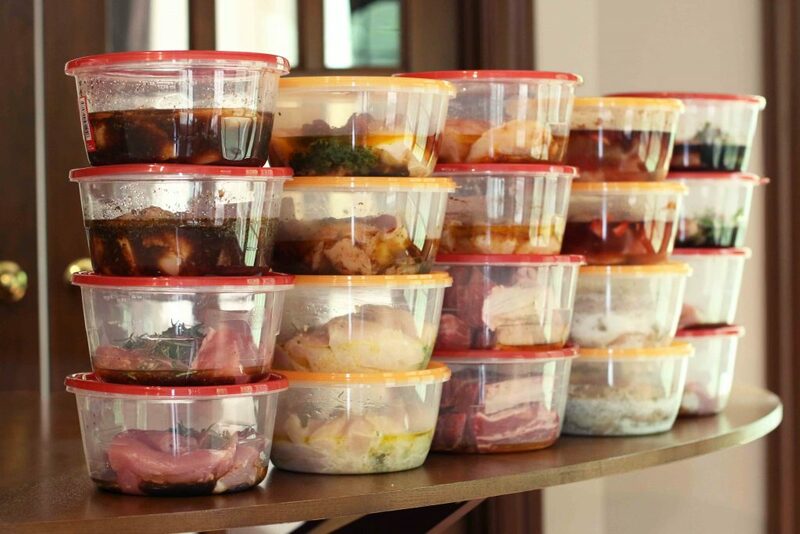 I would love to see a collection of Paleo Instant Pot freezer meals. I had to choose between freezer meals and Paleo when I signed up. Hi, Susan, with membership there is a way to filter for Paleo Instant Pot Freezer Meals. ALL our meals are freezer friendly so you won’t have to choose between one or the other. If you have more questions, please pop into chat in the bottom right-hand corner – we’re here and happy to help! Yes, members are able to filter for Low FODMAP recipes. If you have more questions we’d love to chat with you in the bottom right-hand corner. What does all the quarter mean when talking about meat? Example: chicken park recipe says 1 pound quarter chicken, buttermilk herb chicken calls for 2 pounds quarter chicken (both about breasts), pulled pork calls for 2 pounds quarter pork roast etc. I’m not sure what the quarter part means. Thanks! When something says to quarter meat it just means to cut it into 4 same size (or as same size as possible) pieces. I think you are correct, but I believe others have had success ordering off of the UK Amazon site. Good luck! I am trying to figure out how to help my son who is diabetic and lives 600 miles away from me. any suggestions-can I make these meals and send them in dry ice to him and would he warm them in a microwave ? We do have 2 diabetic menus you could check out for some recipe ideas. I really love the recipes, I would like to cook some of them immediately rather than freezing them. Would the cook time be the same? The recipe I have for corned beef calls for 3-4 lbs and cook for 90 minutes. I have a 2lb corned beef brisket – do I still cook for 90 minutes? Tina, more than likely, no. We would recommend trying between 30 and 45 minutes instead. if i subscribe/join, how many recipes would i have access to in total? With our Once A Month Meals membership, you have access to all our freezable recipes (7,000+) and all our freezer menus (600+)! As a guest to the site, you only see a limited quantity. Can I do deep fried chicken in my instant pot? Hi Norma! We wouldn’t recommend trying to deep free anything in your IP, but there are lots of tasty breaded chicken recipes on our site available to members made specifically for the instant pot.